As the southernmost country in the continent, South Africa is bordered by the three nations of Namibia, Botswana and Zimbabwe. This rugged, wild and multicultural nation is truly unique thanks to its somewhat tumultuous history and widely diverse demographics. It is here that we will today be visiting a modern property, which boasts a simple yet contemporary aesthetic. 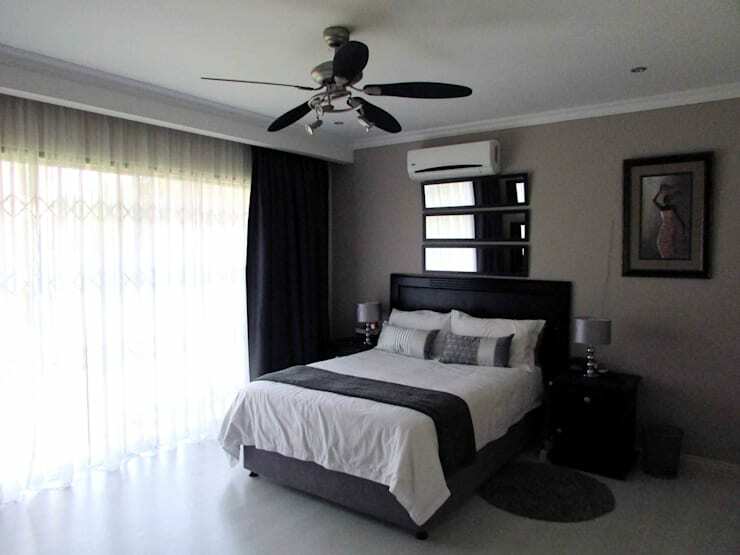 Designed by DG Construction and located in the industrial city of Vanderbijlpark, our feature dwelling has been beautifully brought to life to offer a comfortable and stylish residence. 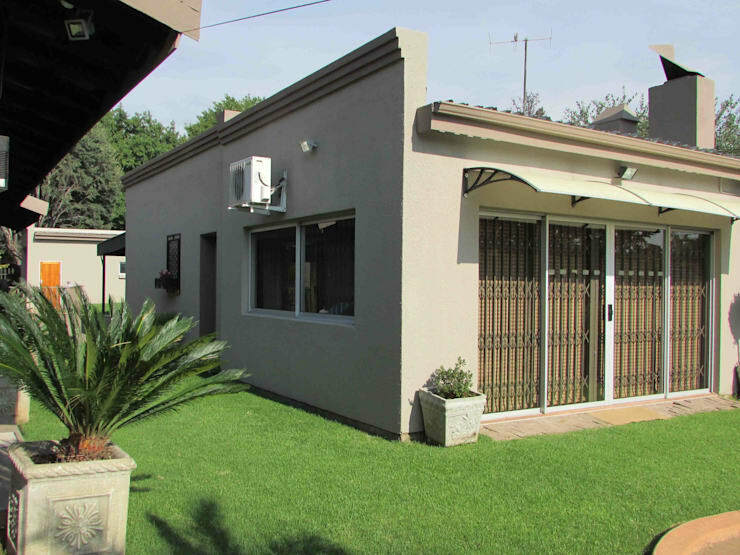 Situated on the Vaal River in the south of the Gauteng province, Vanderbijlpark was once previously a town dominated by iron and steel corporation ISCOR, and now boasts a range of company-built dwellings in need of renovation and refurbishment. Boasting a combination of clean lines and strong architectural forms, this dwelling is neutral and inviting. Simple in its approach, the façade shows off its usability with sliding glass doors that open up two the manicured lawn and landscaped garden area. Typical of many modern homes in the area, the renovation has been kept simple and avoided excessive embellishment or adornment. However, this home is certainly not dull, and invites us in with its muted and neutral colour scheme. A dining room that has definitely been designed for entertaining, this space is elegant, large and well-planned. The clean façade that we saw previously is continued in this room, with elegant materials and timeless furniture. The colour palette is neutral, yet employs some strong contrast to keep the ambience engaging and lively. 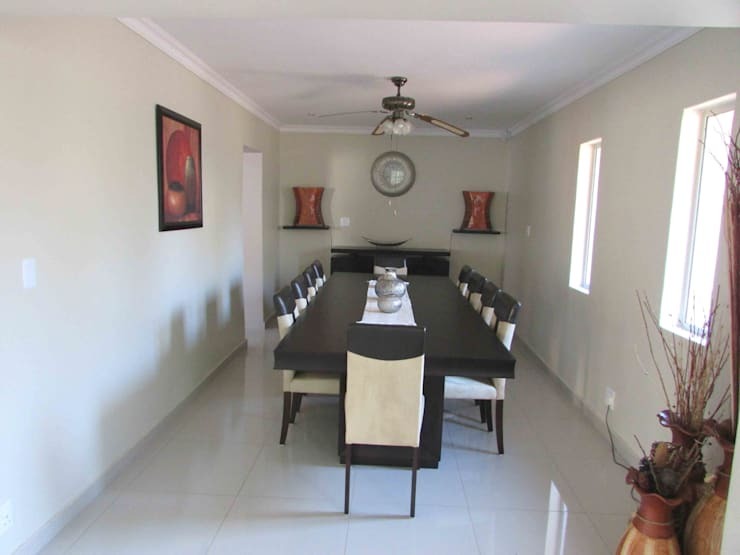 If you are someone who enjoys entertaining (or have a very large family) then this space will definitely appeal. It is very much a blank and stylish canvas to adorn and decorate depending on the occasion. The décor seen throughout this dwelling is definitely eye-catching and attractive, yet follows a certain desired ambience and atmosphere. The pieces are age-defiant, with a sense of modernity and contemporary touches. 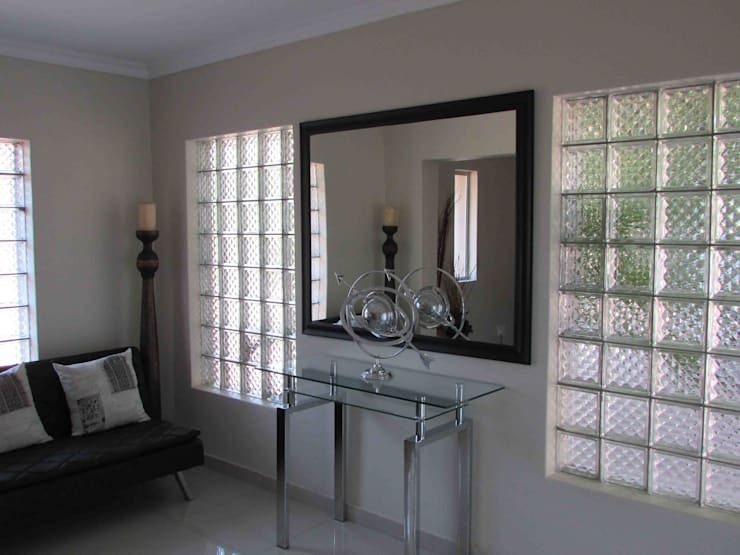 Additionally, glass bricks have been utilised in the walls to bring in a huge amount of natural light, while still offering privacy to those within the home. The light is then reflected against the large entrance mirror, which offers sophistication along with some more practical benefits. 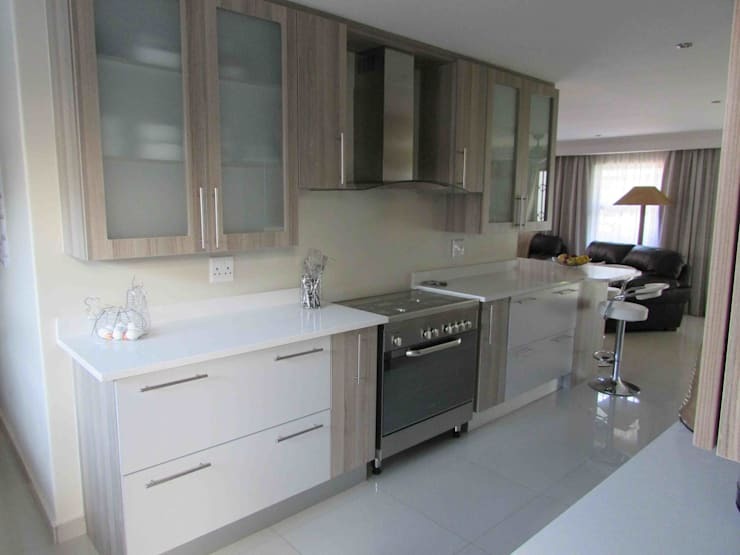 The kitchen is definitely a standout feature for the home and offers a range of different amenities and accessories that are perfect for the modern entertainer or aspiring chef. Aesthetically pleasant with Scandinavian-inspired joinery in a light beech and white hue, the cooking area is simple and functional, yet offers sparkling stainless steel accessories. The colour palette very much matches what has been employed throughout other areas of the home, with a timeless and enduring aesthetic. 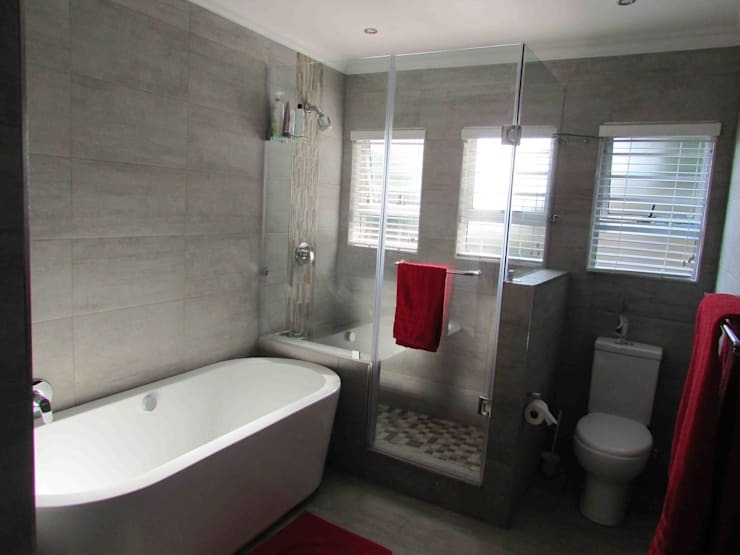 Inside the bathroom we see that the designers have very cleverly worked with the space to fit everything in perfectly. The room is almost Tetris-like in its efficiency, with the bath tucked in neatly between the wall and the shower. A neutral colour scheme is once again employed, with sleek grey tiles offering a muted approach. Colour is injected through the use of bright red accessories, which impart a indulgence and splendour. As we conclude our tour of this modern South African home, we head quickly into the bedroom for a peek at the master suite. Replete with a darker colour scheme and a feeling of relaxation this serene and tranquil spot is sure to entice and lure. Boasting a palette of charcoals, blacks, and earthy grey hues, the room is impressively contrast with bright, crisp whites and a range of striking high gloss surfaces. As with many of the rooms in this house, the bed space is offered ample illumination thanks to the huge window. However, the designers have smartly included heavy window drapes to block the light and allow for long and luxurious Sunday sleep-ins. Were you surprised by the interior of this home?